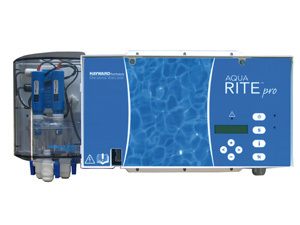 Navigate: Homage / News / Hayward® Industries, Inc. acquires CAT Controllers, Inc.
Hayward Industries, Inc., a market leader in swimming pool and flow control products, today announces the acquisition of Cat Controllers, Inc. a leading manufacturer of automatic water quality management systems for residential and commercial swimming pools, spas, water parks and other water treatment applications. According to Larry Silber, chief operating officer of Hayward Industries, this most recent acquisition is another example of Hayward’s business philosophy of using strategic acquisitions to expand the company’s position in innovative technology and global market presence. Under the ownership of partners Patrick Sweeney and Culin Tate, CAT Controllers have been manufacturing and marketing chemical controllers and remote wireless, web-based management systems for more than 10 years. Together, they have built a strong reputation in the commercial market for innovation, performance, reliability and service. “Thousands of swimming pools, spas, water parks and water treatment applications worldwide rely on CAT Controllers to meet their daily water quality requirements,” says Patrick Sweeney, President of CAT Controllers. “They count on CAT Controllers for years of trouble-free operation and the CAT team to provide customer service, support and technical assistance unmatched in the industry.” “We are excited to become a part of Hayward and leverage the resources of their strong global sales and marketing organizations which will enable us to continue our growth and development” says Culin Tate, Vice President of Sales. According to Silber, both Patrick and Culin will remain with Hayward Industries in key management roles to ensure continuity of service to existing customers and help in expanding Hayward’s market presence.